John W. Rooda, Age 65, of Ross Township, passed away on October 21, 2010. He is survived by his loving wife and best friend of 38 years Linda (nee Brown) and two sons, W. John Rooda of Dearborn Heights, MI and David M. Rooda of Ross Township. He is also survived by his aunt Edith Ward of Crown Point, and numerous nephews, nieces and cousins. He was preceded in death by his parents Robert H. and Harriet Livingston Rooda and sister Carolyn Underwood. John graduated from Horace Mann High School in Gary and Indiana University School of Business. He served in the United States Army until his honorable discharge in 1974. He was employed by the USS Gary Works as an accountant and retired from the E. J. & E. Railway. He was a member of Gary Lodge #677 F.& A.M., Scottish Rite, and Orak Shrine. John served his community as a public official for over 34 years. He was elected to the Merrillville Town Council in 1976 and reelected in 1980. 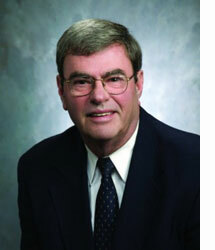 He was elected Ross Township Trustee in 1982 and reelected for six more terms. He currently served as the President of the United Township Association of Indiana. Friends may visit at Burns Funeral Home, 10101 Broadway, Crown Point, IN on Monday, October 25, 2010 from 2:00 p.m. to 8:00 p.m. Funeral services will be held at 10:30 a.m. on Tuesday, October 26, 2010 at Burns Funeral Home, with Rev. Theodore Poteres officiating. Burial will follow at Calumet Park Cemetery in Merrillville. Memorial contributions in his name may be made to VNA Hospice Center, 2404 Valparaiso Street, Valparaiso, IN. John sincerely appreciated the support of the residents of Ross Township and felt honored for the opportunity to serve. He was the very definition of public servant.